Forty years ago this month, I attended my first summer conference of the Maryland Association of Counties in Ocean City. Going down without a hotel reservation, I wound up sleeping on the couch of a house rented for the week by a Howard County Council member. In my first month on the job as associate editor of the Columbia Flier, I didn’t know any better and I certainly didn’t know much about county or state government. Going down last Thursday again without a reservation, I wound up staying in an overpriced dump of a motel that showed little sign of renovation since my first MACo trip. Rereading my piece from 1975, reposted at the bottom of this story, from a microfilm printout, it was funny how many aspects of the annual confab were the same. The opportunity to “share ideas and solutions with other county officials is extraordinarily valuable,” said Montgomery County Executive Ike Leggett, MACo’s president this year, echoing past presidents. “I think there was remarkable attendance” at the dozens of work sessions over three and half days. The weather had been gorgeous — not too hot and humid — and there was a great temptation to head to the beach. Citizens back home believe their public officials downy ocean were “having fun,” Leggett said, but there was “remarkable hard work” going on the kind of topics that could bore the average taxpayers to tears except when things go wrong — infrastructure, jails, IT, budgets, zoning, waste management. That’s why it’s always such a struggle for reporters to write about the conference, without emphasizing the receptions and the crab feast, or the costs — probably at least $1,000 a piece for over 900 state and local officials, counting peak season hotel rates, mileage and meals. News did break out Friday morning in a session on economic development. Most of the hundreds of people in the huge meeting room probably didn’t realize it until the next day when they heard about the Sun’s front page story on Housing Secretary Ken Holt’s unforced error about lead-paint poisoning and landlords. It earned Holt a slap down from the lieutenant governor the next day, and calls for his resignation from 30 Democratic legislators on Monday. For most in the cavernous hall, it was merely a strange anecdote of a mother poisoning her own child with a lead sinker to get free housing from a landlord. Only problem it wasn’t true, and the governor or his staff didn’t authorize Holt’s comments. Most conference attendees had other things on their minds. Holt’s comments were just a blip sandwiched between economic development secretary Mike Gill’s always upbeat view as Salesman-in-chief of Maryland’s glass half-full or brimming, and more local economic development concerns. 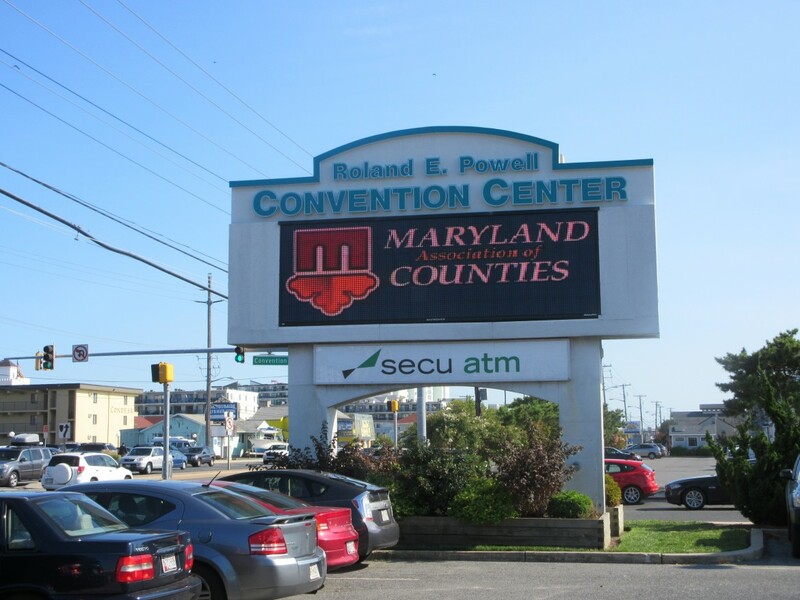 For Gill, the MACo conference was a reminder of his family vacations in Ocean City as a kid when his father Robert Gill was on the Baltimore County Council in the early 1960s. He brought the whole family down, but would disappear for days at the conference, Gill said. “Maryland is open for business,” said Gill, repeating the Hogan mantra. “I really believe attitude is everything,” he said. Unlike Holt, he was short on specifics. “Unless the governor throws me out, I’ll be back next year,” Gill said, a comment perhaps better suited to Holt. Gill was questioned about relocating companies which sought tax incentives. Gill deflected the questions by saying Maryland needs to “do a better job with what’s in our tool box.” He made no mention of Virginia’s bigger toolbox of incentives. “If you’re looking for the cheapest guy, go somewhere else,” Gill said. Economist Anirban Basu was as usual fast clipped and funny. He tried to answer the question of “why are we so unhappy” in the 74th month of economic recovery? Mainly because wages have not grown and there’s a lack of absolute progress in the state’s economy, particularly outside the central Maryland corridor. Some rural counties have actually continued in decline. MACo attendance breakdown from last year’s conference. As was true 40 years ago, the informal interactions between elected and appointed officials are as important as the formal sessions. These can occur in conversations out in the hallway or over steamed crabs. Most of the governor’s cabinet was on hand for a reception Friday, including Lt. Gov. Boyd Rutherford, a tradition begun by Gov. William Donald Schaefer in the late 1980s. The exhibit hall with 230 exhibition booths is where much of that interaction occurs. The exhibitors are the real money maker for the association, according to MACo executive director Michael Sanderson. The commercial vendors, like Comcast, Verizon, BGE, Waste Management and companies you’ve never heard of pay at least $1,400 a booth, $2,400 for two, and all the state agencies and counties are represented as well, paying $600 for a booth. With several hundred thousand in payments, the exhibitors “take the pressure off the taxpayer” for the cost of the conference, Sanderson said. Many of the special luncheons and breakfasts are sponsored by government contractors, as well. Sneaks, mascot from the Maryland Library Association booth in the exhibit hall of the Ocean City Convention Center. Lt. Gov. Boyd Rutherford gives closing speech at Maryland Association of Counties summer conference. Sanderson said they had budgeted lower numbers than last year’s election spike in attendance, but to their surprise, attendance was actually up this year, with 2,200-2,400 people registered, including the exhibitors. As giveaways, there were brochures galore, Frisbees, squeezable crabs, footballs and globes, and enough promotional pens to last years worth of scribbling. The governor traditionally gives the closing speech, but Hogan, undergoing chemotherapy for lymphatic cancer, took the advice of his doctors and family, and let Rutherford give the speech. “He did really want to be here,” Rutherford said. With his smartphone, Leggett took a video of the audience wishing the governor get well. A slight majority of elected county officials in Maryland are Republicans. Rutherford’s speech made no news, reciting a long list of Hogan’s accomplishments and goals, but he did make a little news afterward answering reporters’ questions about Housing Secretary Holt’s comments the previous morning. MACo coverage by Len Lazarick in the Columbia Flier from 40 years ago.